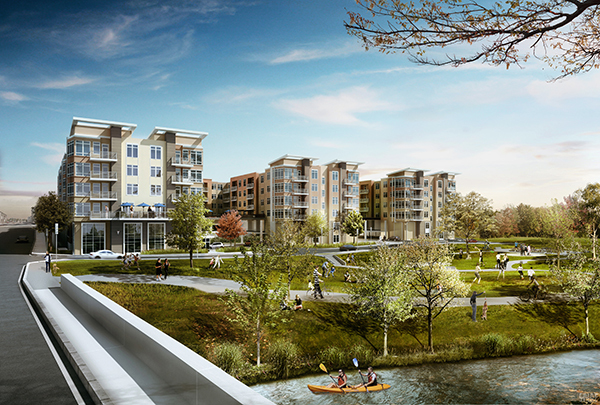 Located on a 4.1 acre site, 36 River Street, known as Currents on the Charles, is a vibrant multifamily development located directly on the Charles River at the nexus of the Waltham, Watertown, and Newton town lines and adjacent to the Charles River Bike Path, which connects directly to Downtown Boston. Gate Residential developed the concept and design of this residential building with supporting amenities to serve a market of hard-working professionals, energetic empty nesters, and contemporary families desiring neighborhood living with city access. Gate Residential sold the fully entitled site along with 100% construction documents to Hines in March 2013.